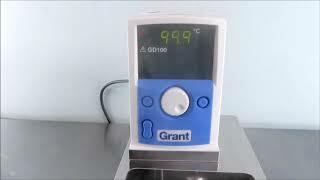 The Grant GD100 Circulating Immersion Bath comes with digital PID temperature control in a speedy compact form. This 5-liter circulating water bath has an easy to navigate, clear digital thermostatic control unit allowing you to adjust temperature in one degree increments. This circulating immersion bath also features an alarm, three adjustable preset temperatures, and a low liquid float switch. The built in integral pump provides clean circulation within the water bath while operating at a whisper quiet decibel. The Grant GD100 is suitable for a wide range of applications from various industries. These Grant GD100 Circulating Immersion Baths have been fully inspected and reached their max temperatures without issue. All of out lab equipment comes backed with our standard warranty. Should you have any questions, please don't hesitat to contact us.